We’ve got exciting news! 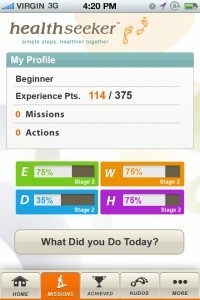 Healthseeker, our award-winning Facebook game, has just gone mobile. The Healthseeker Mobile app will give you the freedom to play the game on your smartphone so you’ll be able to seamlessly integrate health missions into your daily life and move one step closer to achieving your lifestyle goals. HealthSeeker is a unique collaboration between experts, advocates and industry partners who are on the front lines of healthcare. It was built using GoodLife™, a serious games engine designed by Ayogo. Ayogo developed the game for the Diabetes Hands Foundation in collaboration with Joslin Diabetes Center, with support provided by Boehringer Ingelheim Pharmaceuticals, Inc. and Lilly USA, LLC. Healthseeker was designed with the goal of helping adults living with diabetes or those at the risk of developing diabetes with specific lifestyle and nutritional challenges. The game creates compulsion loops around reciprocal social obligation, gifting, collection, and achievement to motivate action and engage people in a healthier life. The idea of shifting a player’s concerns from big commitments over long periods of time for greatly deferred rewards to small manageable actions in short periods of time for instant rewards, has been very popular with players and medical professionals.